Sustainability and respect for the environment | Madel S.p.A.
Madel is characterised by its “Green Philosophy”. In all its productive processes it offers maximum commitment in the care for the environment with activities ranging from the selective waste disposal for the reuse of residues, both plastic and liquids, to the recycle of hot water coming from the industrial process to heat the working rooms. Even the lighting of the company is sustainable, as demonstrated by the almost 500 LED lamps installed that save 166,840 kWh each year compared to the “old” neon lamps. 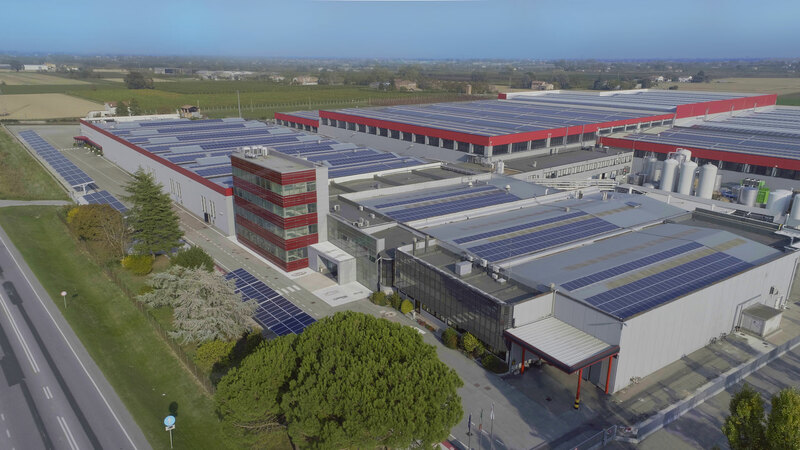 A 2.6 MW photovoltaic system has been installed on the roof of the company for a total surface of 55 thousand square meters. Furthermore, a last generation cogenerator offers its contribution of 0.65 MW, covering 100% of the electricity needs. It is a state-of-the-art engine that improves the energy efficiency of the entire factory by recovering the thermal energy produced to heat the water necessary for the company’s processes. The small part of energy that is purchased externally is 100% clean and certified by the bECO – Absolutely Pure brand that guarantees its origin, that is exclusively from renewable sources, specifically hydroelectric and ocean. For years Madel has been involved in social activities by supporting and collaborating with several non-profit foundations which operate both internationally and locally.